Australian dollar coins exist since 1966, when Australia abandoned its old currency, the pound. While all circulating coins are produced by the Royal Australian Mint in Canberra, bullion coins are struck at the Perth Mint. Yet, all Australian coins bear the portrait of Her Majesty Elizabeth II, Queen of Australia on the obverse. Nowadays, Australian bullion coins are popular among investors in the US as some – the Gold Kangaroo/Nugget, the Silver Kookaburra, and the Platinum Koala – are eligible for a precious metal IRA. Coinage was introduced into Australia after Great Britain established a penal colony on New South Wales in 1788. However, only very little money circulated in the newly acquired territory, including some English coins as well as some guilders, ducats, rupees, johannas, mohurs, and Spanish dollars. The first official coin of Australia was the “Cartwheel Penny,” which was a copper coin struck at the Soho Mint in Birmingham and exported to New South Wales beginning in 1797. All coins circulating in the colony at the time were valued well above their face value in order to retain as many coins as possible in Australia. The “Holey Dollar” and the “Dump” were introduced in 1813 as the colony continued to expand. Gold findings in the mid-nineteenth century allowed Australia to produce its first gold coins – albeit without the Crown’s approval. Shortly thereafter, the first Royal Mint outside of England opened in Sidney, striking sovereign coins with the inscription “AUSTRALIA.” The colony’s vast gold reserves led to the opening of a second mint in Melbourne in 1872 and a third one in Perth in 1899. The Commonwealth of Australia was proclaimed in 1901 and the first distinctive Australian coins – the florin, sixpence, and threepence – were issued in 1909. Australia’s first penny and halfpenny followed the next year. The Royal Australian Mint – the first mint in the commonwealth that is not a branch of the Royal Mint in London – was established in Canberra in 1965 to usher in the production of decimal coinage. A year later, Australia abandons the British-style currency system of pounds, shillings, and pence to introduce decimal notes and coins, with the major unit being called “dollar.” In 1986, the Commonwealth Government tasked the Perth Mint to design, make, and market Australia’s official precious metal bullion coin program. With the Australian Nugget, Kangaroo, Kookaburra, and Lunar coin series, the Perth Mint developed an exceptional reputation for striking first-rate precious metal coins coveted by both collectors and investors. The Gold Corporation was founded through the Gold Corporation Act 1987 to take over the Mint’s operation and launch Australia’s bullion precious metal program with the Australian Nugget. As a matter of fact, the Perth Mint now issues the world’s largest range of fine gold and silver investment coins, which are known across the world for their handsome designs and outstanding craftsmanship. The Perth Mint produces two kinds of fine gold bullion coins, the Australian Kangaroo Gold Coin Series and the Australian Lunar Gold Coin Series. The former is available in five sizes: 1 kilo, 1 ounce, ½ ounce, ¼ ounce, and 1/10 ounce. The latter is minted in nine different sizes – 10 kilo, 1 kilo, 10 ounce, 2 ounce, 1 ounce, ½ ounce, ¼ ounce, 1/10 ounce, and 1/20 ounce. Furthermore, the Perth Mint strikes silver bullion coins, namely the Australian Kookaburra Silver Coin Series, the Australian Lunar Silver Coin Series, and the Australian Koala Silver Coin Series. The Kookaburra Series comes in three sizes: 1 kilo, 10 ounce, and 1 ounce. The Mint issues the Lunar Series in seven sizes – 10 kilo, 1 kilo, 10 ounce, 5 ounce, 2 ounce, 1 ounce, and ½ ounce. The Koala Silver Coin series is produced in four sizes: 1 kilo, 10 ounce, 1 ounce, and ½ ounce. Lastly, the Perth Mint also makes a platinum bullion coin – the Australian Platypus Platinum Bullion Coin, which is only available in 1 ounce. 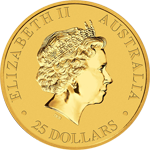 All Australian bullion precious metal coins have legal tenders status in Australia, although the precious metal value of each coin may greatly exceed its face value. For that reason, these coins pose a solid safeguard against inflation in today’s volatile markets. The market for trading bullion coins also tends to be more active overseas, so Australian coins may be a particularly attractive vehicle for American investors. In addition, the Perth Mint produces a large variety of precious metal coins, allowing investors to make profits on their purchases if they keep up with the latest gold, silver, and platinum market trends. Lastly, three types of Australian bullion coins can be added to an IRA in the US – the Gold Kangaroo/Nugget, the Silver Kookaburra, and the Platinum Koala. Besides being valuable, beautiful, and popular collectable coins, each Australian Gold Nugget is backed by the Western Australian Government. Investors covet Koala Silver coins mostly because of the intrinsic worth of their metal content. The appealing subject and the annually changing design have also made them popular with some collectors. Collectors who enjoy the excitement of gathering beautiful, limited, and legal-tender coins should consider Australian Lunar Silver coins. However, these coins are not eligible for a Silver IRA. Kookaburra silver coins really are legal tender in Australia. However, the face value is only nominal, while the value of the coin’s precious metal is usually higher. Investors and collectors who want to diversify their precious metal holdings should to consider the Australian Platinum Koala coin if they want to add a high-value metal to their portfolio.